This Easter, before assembling with other believers, I visited Joshua’s grave. For me visiting graves has rarely been comforting. In fact, it is the opposite. The graveyard seemed too permanent. It contained too many granite stones which testified to both the pervasiveness and intransigence of death. I have found in recent years visiting graves is good grief therapy for me. It can become a moment of spiritual encounter with God as I learn to face the grief and live through it rather than avoid it. As I drove to the grave on Sunday morning early, I listed to some lament Psalms (including several musical versions of Psalm 13). I imagined the journey of the women to the grave that morning. I felt the lament, the sadness, and the disappointment (lost years, what could have been, he’d be 31 now). The women and I shared something. At the grave I remembered, prayed, and protested. But the grave does not have the final word. It seems like it does. Death overwhelms us–it looks permanent, immutable, and hopeless. But that is why I assemble with believers on Easter (but also every Resurrection day, every Sunday). When we assemble, we profess our hope, encourage each other, and draw near to God. We encounter the living God who is (yet still, even now, and forevermore) the God of Abraham, Isaac, and Jacob. The hope of the resurrection is a future one. God did not leave us without a witness to the future. The resurrection of Jesus is our resurrection. His victory is our hope. His empty tomb is the promise of our own. That hope, for me, is experienced not so much at the grave (though God may be encountered there as well), but in the assembly. When I assemble with other believers to praise, pray, and profess. In that moment the assembly of believers becomes one–one with the past, present and future, heaven and earth become one, and God loves on those gathered. In that moment, I stand to praise with Joshua rather than without him; we are one for that moment at least. 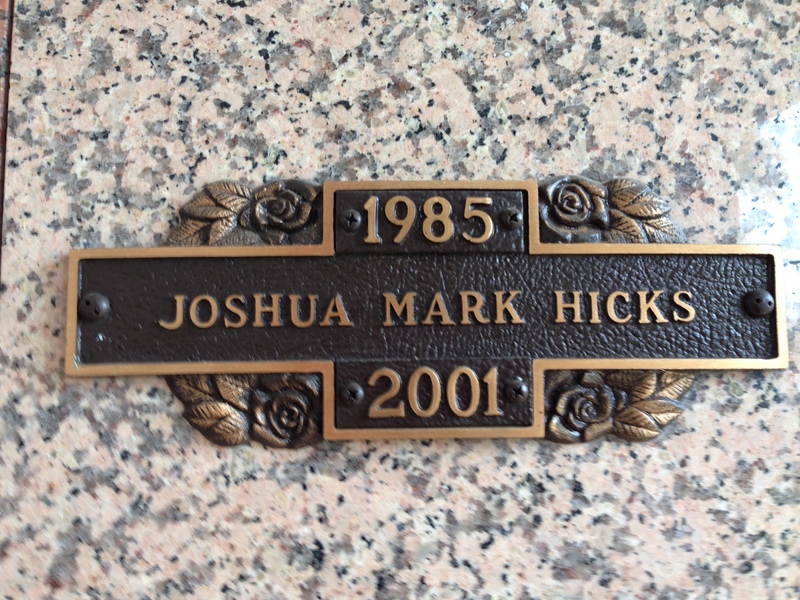 We continue to lament–both Joshua and I. We both yearn for the new heavens and new earth. We both pray for the day, like the souls under the altar in Revelation 6, when God will put things back to right and make everything new. But for now the journey from the grave to the assembly is no easy one. It is filled with obstacles. Faith is a struggle and the walk is arduous. But at the end of the journey is an empty grave rather than a filled one. Many have heard about the “five steps of salvation,” but here are my “five steps” toward visibly embodying the unity the Spirit has already created. Transformation – we are sanctified by the Spirit (1 Thessalonians 4:3-8). Liturgy – we worship in the Spirit (John 4:24; Philippians 3:3). Practicing the Kingdom of God – we minister in the power of the Spirit (Luke 4:18-19). Spiritual Formation Practices – we pray in the Spirit (Jude 20). See the fuller article here. I have some suggestions for Christmas! But first a little biblical theology…. These festivals did double-duty. Not only did they celebrated the Spring and Fall harvests, they were also tied to God’s redemptive acts within Israel’s history. Just as the Passover remembered the Exodus, so the Pentecost remembered the giving of the Torah at Mt. Sinai and the Feast of Tabernacles remembered the forty-year wilderness pilgrimage to the Promised Land. The festivals, then, gave thanks not only for God’s present blessings in the harvest but also identified the present people of God with their ancestors. Through the festivals, Israel relived its history and received God’s gracious harvest gifts. Embedded in Israel’s calendar, these annual events regulated Israel’s communal life. They provided a rhythm of identity, memory, and thanksgiving for Israel’s life with God. In addition, they also provided a rhythm of generosity. When Israel gathered to celebrate the harvest festivals, they were warned to “not appear before the Lord empty-handed.” They were to “give as they are able, according the the blessing of the Lord your God” (Deuteronomy 16:16-17). Israel not only enjoyed its harvest, but it shared its harvest. More specifically, they shared their harvest with “the resident alien, the fatherless, and the widow” (Deuteronomy 16:11, 14). This three-fold concern–the resident alien, the fatherless, and the widow–is a recurring emphasis in Deuteronomy (10:18; 14:29; 24:17, 19; 26:12-13; 27:19) as well as within the rest of the Hebrew Bible (Jeremiah 7:6; 22:3; Ezekiel 22:7; Zechariah 7:10; Malachi 3:5; Psalm 994:6; 146:9). In particular, the call to bless and protect the “resident alien” within Israel receives special emphasis. The verb or nouns forms for this term occur 175 times in the Hebrew Bible. Variously translated as “sojourner,” “resident alien,” “foreigner,” or “stranger,” it describes a person who is not native to the land in which they live. Israel, for example, was an alien in the land of Egypt (Deuteronomy 23:7), and Israel should love aliens because they were aliens in Egypt (Deuteronomy 10:19). When Israel harvested its crops and celebrated God’s blessings, God expected they would share their blessings with the “aliens” among them. This is a rhythmic and ritualized generosity. Such ritual patterns not only symbolize Israel’s values, they also shape hearts and cultivate those values in the community. Christmas has become that kind of ritual for Christians. It is a season in which we share with others. While as a cultural phenomenon the season is too often focused on consumerism and self-absorbed as well as extravagant family celebrations, it should be a time when families celebrate their lives together and share with each other while they also share with others. Israel’s festivals were not self-focused or self-interested. They enjoyed God’s blessings as families, but they also included included the poor, the widow, and the orphan. And, more to the point of recent days, they included the stranger, the alien, the foreigner, or immigrant. So, here are my Christmas suggestions. Second, when we share our Christmas giving with others, share with the immigrants in your community! Just as Israel, include the immigrants in your festive generosity. Third, identify immigrants in your world who work on the margins of your life–such as facilities workers, yard workers, etc.–and give them a Christmas gift. Fourth, practice this as a communal (church) or family ritual so that its values are cultivated in your community or family as a regular, habitual, and annual festival analogous to Israel’s harvest festivals. When God called Israel into this kind of ritualized, communal, and habitual practice, it seems to me God understood the practical effect this would have on their lives, characters, and communal life. It not only teaches us something but forms us into a particular kind of people. The Lord God took the adam and rested adam in the Garden of Eden to serve and protect it. These texts identify humanity’s vocation. They invite humanity into God’s goal for the creation. God invites humanity to flourish, fill the whole earth, subdue the cosmos, and protect the divine sanctuary. God intends for Eden to expand and fill the earth as humanity faithfully participates in God’s mission. We are God’s junior partners in that mission. God created us as God’s own images in distinction from all other life. Humanity has a special role within the creation as the image of God within the cosmic temple, God’s house. As the living images of God within the creation, humanity represents God in the world, mediates God’s presence as priests, and reigns over the creation as royalty. When God finished the temple, God placed images within it. Human beings (both male and female) are those images. This is humanity’s expansionistic function. God “rested” humanity in the Garden. The Hebrew Bible uses this word to describe divine and human rest on the seventh day (Exodus 20:11; 23:12; cf. Deuteronomy 5:14), God’s gift of rest to Israel in the land (Deuteronomy 25:19; Josh. 1:13, 15; 1 Chronicles 23:25; 2 Chronicles 14:6), and God’s habitation of the temple (2 Chronicles 6:41). God created adam (the human being) from the adamah (ground) and rested adam in the Garden to rest with God as a royal priest in Eden. Eden, however, was not a static reality. God intended humanity to multiply and fill the whole earth, to expand Eden until it filled the earth, until everything was “Holy to the Lord” (Zechariah 14:20). Humanity, as well as animal life, is to populate the earth, and God “formed” the earth “to be inhabited” (Isaiah 45:18). God multiplies and fills the earth with glory through the praise of God’s creatures (cf. Genesis 1:22; 8:17; 9:1, 7). God multiplied Israel (Genesis 47:27; Exodus 1:7; Leviticus 26:9; Jeremiah 3:16) and later multiplied the church (Acts 6:1, 7; 9:31; 12:24) as an embodiment of this original vision. Nevertheless, when humanity failed to cooperate, God scattered them. Yahweh scattered humanity at Babel, Israel through exile, and the church through persecution. The divine mission is to fill everything—the heavens and the earth—and everyone with God’s glory. This is humanity’s creative function. As Creator, God brought order out of chaos. Hovering over the waters enclosed in darkness, God brought order to an uninhabitable earth, a chaotic void. God subdued the earth to provide habitable space, and then God filled the space with life. Unfortunately, some believe the call to “subdue” empowers humanity to exploit the earth and deplete its resources. On the contrary, “subdue” partners with God’s creative work to bring order out of chaos. The seven days of creation did not rid the cosmos of chaos. Darkness still exists, the waters still exist, and a chaos figure—the serpent—entered Eden itself. God called the light good but not the darkness. God did not remove the waters but gave them boundaries. Outside of Eden, chaos exists within the creation. Humanity partners with God to subdue the remaining chaos. This ordering includes things as diverse as domesticating a field for crops or goats for milk as well as developing software programs to bring order to a chaotic mass of data. To subdue the earth means to partner in God’s creative work; it does not mean abusing or exploiting the creation. Whatever chaos remains in the creation, humanity is called to subdue it and order it for life in partnership with God. This is humanity’s royal vocation. Too often we hear “dominion” in tyrannical, oppressive, militaristic, or manipulative ways, but this is not how God rules. As images of God, we rule in the likeness of God. For example, the kings of Israel, though they did not always effectively do so, represented God in the nation. God desired they rule with justice and mercy. Psalm 72 reminds Israel what “dominion” means, the humble exercise of power in the service of mercy (cf. Leviticus 25:43, 46, 53). Their rule was supposed to be more like how a shepherd “rules” (cf. Ezekiel 34:4) rather than how a dictator “rules.” Far from exploitation and abuse, God’s imagers rule as servants who give life. They benevolently care for the creation. This gains greater clarity when we recognize we are co-rulers with God. God shares dominion with us. We are co-workers, junior partners. This is our identity, and it is part of our mission to develop the full potential of creation as we lovingly care for it and gratefully enjoy it. We pursue familial, social, and communal shalom as we embody the justice and mercy of God within creation. This vocation involves every aspect of human life. The arts (music, literature, fine art) are expressions of human creativity. Technology manages resources; medicine serves wholeness; and social structures shape community. These are part of the human vocation, our partnership with God, as co-rulers and co-creators within the creation. This means no work is “secular” as if it is disconnected from our missional identity. Every good work—no matter how “secular”—participates in the mission of God. Human beings are called into multiple kinds of works or different vocational careers. As participants in community, we choose particular careers. We choose these careers as means to love God and serve our neighbors. Through these careers, we participate in the mission of God. Medical professionals partner with God in healing. Financial counselors partner with God as they mediate justice for creditors and mercy for debtors. Professionals in the legal community partner with God as they pursue justice. Environmental biologists partner with God as they preserve and care for the creation. Partnering with God toward the fulfillment of the mission of God is ministry in the kingdom of God. Nurses, counselors, biologists, and lawyers co-rule with God. Through their careers, they are ministers and royal priests in God’s kingdom. This is humanity’s priestly vocation. We are priests in the temple of God. Though English translations often given an agricultural feel to these Hebrew verbs, such as “till it and keep it” (Genesis 2:15), Ellen Davis (among others) has demonstrated this is priestly language (Getting Involved with God: Rediscovering the Old Testament, 192-194). Elsewhere in the Hebrew Bible when these two words occur to together, they describe the Levitical service of God’s appointed servants in the tabernacle (Numbers 3:7-8; 8:26; 18:7). The first verb normally describes ministering or serving the ground (Genesis 2:5; 3:23; 4:2, 12) or the garden (Genesis 2:15). The second verb is normally translated “keep,” “guard,” or “protect.” Priests protect or guard the holiness of the sanctuary. This may include agricultural dimensions, but given the temple and sanctuary language in Genesis 1-2, it stresses humanity’s priestly role within the creation. Like priests in the temple, we serve God’s creation and protect it from anything unclean. As priests, we mediate the praise of creation to the Creator, and we mediate God’s rule over the world in the creation. We represent the creation in our praise of God, and we fill the material world with thanksgiving as we receive the creation from God with gratitude. As priests, we bless the creation and lead the creation in blessing God. Priests are deeply connected with the parties they mediate. As images of God, we represent God to the creation. As part of creation, we represent creation to God. We are spiritual-material beings who participate in both the spiritual reality of God and the material reality of the creation. This is part of our human identity. God placed humanity in the Garden of Eden as divine images in the cosmic temple of God to serve in God’s sanctuary. As living, breathing images of the living God, humanity was tasked to partner with God in ruling over life upon the earth, subduing the remaining chaos, filling the earth with God’s living glory through human flourishing, and serving and protecting God’s sanctuary. Humanity is gifted to co-rule, co-create, and co-subdue in partnership with God. This is, at least in part, what it means to live as the image of God within God’s cosmic temple. while the Spirit of God hovered over the face the waters. Then God saw everything made, and, Wow!, it was really good. The title is a rather controversial one in the history of Christian theology. Many suggest the original creation was something akin to Platonic perfection, which resists any change because if one changes what is perfect, then it is no longer perfect. This kind of perfection has no room for change or development except devolution. One cannot improve on perfection. However, this view actually undermines important features of creation within the biblical narrative. It fails to recognize the presence of chaos within the creation, the dynamic reality of creation, and the goal (telos) of creation. When God finished creating, the creation was deeded “really good” (Genesis 1:31). However, the question to ask is, “Good compared to what?” What is the meaning of the word “good”? This can have moral, aesthetic, and functional connotations. Perhaps it means all three. God created good—not evil, God delights in the beauty of the creation, and God created the cosmos with a patterned regularity that works. Nothing in that language intimates perfection but only the fulfillment of God’s intent in creating. Genesis 1:2 offers a clue to the meaning of the term. Taking Genesis 1:1 as a kind of section heading, Genesis 1:2 describes the earth before God begins to “make” the world as God intended. At that point, the earth is “without form and void” (tohu wabohu). Whatever the origin of this state, it is chaotic. Genesis 1, then, describes the process by which God turned earth’s chaotic waters into good, habitable space suitable for life. God orders the chaos in such a way that life is potentially fruitful and creation may blossom into its full potential. Creation is “good” because it is suitable for life with all its diversity, regularity, and habitable space. Tohu wabohu characterizes the disordered state of the cosmos before God begins the creative work of building and filling, which is one way to describe how God made the world. This is the pattern of Genesis 1:1-31. Another example is how God bounds the waters rather than eliminating them (cf. Job 38:8-11). Just as God separated light from darkness, so God separates the waters from the dry land (Genesis 1:9). The watery “deep” in Genesis 1:2 (tehom) is part of the chaotic reality. The presence of the “deep” is a threat to the functionality of creation, and its destructive capacity is present in the Flood narrative where the “deep” is the source of the flood waters (Genesis 7:11). It is an act of “uncreation” and reverses the creative work accomplished in Genesis 1. But the new heavens and new earth envision a home where there is no more sea (Revelation 21:1). At the end of the sixth day, chaos is still present within the creation. The world is not idealistic or perfect. Chaotic forces are present. They are not evil; nor are they necessarily hostile. Rather, they are the “stuff” out of which creation emerges, develops, and is dynamically ordered. Chaos still exists within God’s good creation, and part of the dynamic process of God’s continuing work in the world is bounding, ordering, and ultimately eliminating that chaos. Creation is Dynamic, Not Static. God intended creation to grow, mature, adapt, and change. Creation was intended to develop into a future fullness—to become all it could be or to reach its potential. Genesis 1 is only the starting point; it was not the goal. Consequently, creation is always in process. Under God’s sovereign care and in partnership with humanity, the creation would emerge, grow, and develop till the divine telos was reached. One indication of this divine intent is that humanity, like other creatures (Genesis 1:22), is blessed to “be fruitful and multiply and fill.” Humanity, like other creatures, is to populate the earth and the whole earth, as Isaiah confessed, God “formed to be inhabited” (Isaiah 45:18). As every parent knows, having children changes things. Indeed, everything changes. Filling the earth is a process replete with change, development, and the scattering of human beings (and other creatures) across the planet—in much the same way Yahweh scattered humanity at Babel, scattered Israel through exile, and scattered the church through persecution. Another indication of this divine intent is how creation participates in its own development. God created “light” by commanding it into existence, “Let there be light!” (Genesis 1:3). In contrast, God invited animal life to participate in their multiplication—not only in the command to “multiply” but also in addressing how the waters and the land “bring forth” living creatures (Genesis 1:20, 24). Unlike “let there be light,” which is an imperative command, let them “bring forth” is a jussive, which signals a participatory process. These indicators, among others, suggest creation is a dynamic process rather than a static perfection, and creation participates and contributes to its own development. God and creation cooperate in the development of creation’s potential. Creation’s dynamic character assumes God has a goal for the creation. God created with a purpose, and, therefore, creation has a telos. God, in partnership with humanity and in cooperation with creation, sovereignly and actively pursues that goal. This pursuit is the outworking of God’s mission. Broadly, the missio Dei (mission of God) is to draw humanity into the circle of the Triune fellowship, unfold the full potential of the creation, and fully enjoy what has been created. Ultimately, creation’s goal is to become the home of the Triune God, in which God dwells and which God fills with divine glory. God delights in, rejoices over, and communes with the creation, both humanity and everything else. The divine mission is to fill everything—the heavens and the earth—and everyone with glory so that God might rest in the creation where God will delight in the creation and the creation will delight in God.